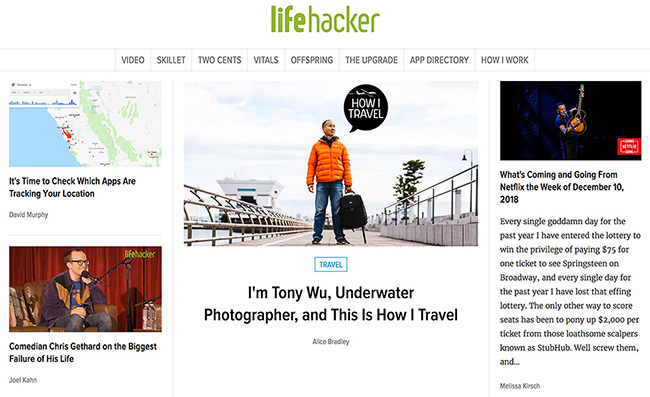 Lifehacker has just posted an interview I did a couple of days ago for the site's How I Travel series. Despite challenges posed by travel, time zones and technical difficulties, Alice and I managed to have a great talk. Somehow, she managed to pull together something sensible from my rambling reponses to her questions. No mean feat. Andrew Faulk, a photographer based in Tokyo, was given the challenging task of photographing me in a non-dorky manner. He did the best he could, given the subject. Seriously though, he's a great guy. It was a pleasure spending a few hours with him.